Artists Daniel Ramirez and Buzz Spector were studio mates in the MFA program at the University of Chicago in the 1970s, forging a friendship that has lasted ever since. They join MOCRA Director Terrence Dempsey, SJ, to reflect on a range of topics, including the impact of philosopher Ludwig Wittgenstein on their work, and the evolution of their artistic output over the decades. Active as an artist for over 45 years, Daniel Ramirez is Professor Emeritus of Art at the University of Wisconsin. Now residing in Chicago, Ramirez is regarded as an outstanding minimalist artist equally adept at painting, drawing, and print-making. He has been exhibited across the United States and Europe, and his works are included in many public and private collections, including the Indianapolis Museum of Art, the Museum of Contemporary Art, Chicago, and the Art Institute of Chicago. Ramirez brings to bear the music of French composer Olivier Messiaen, the lines of Gothic architecture, and the philosophy of Ludwig Wittgenstein on his serenely intellectual paintings and prints. Regular visitors to MOCRA will be familiar with his paintings Cælestis/Spatium/Res and Cælestis Præsepe, large trapezoidal paintings that seem to hover off the wall. In 2004, MOCRA presented a series of small etchings by Ramirez titled Twenty Contemplations on the Infant Jesus: An Homage to Olivier Messiaen. Buzz Spector is an artist, writer, and Professor of Art in the College of Art of the Sam Fox School of Design and Visual Arts at Washington University in St. Louis. His art practice makes frequent use of the book, both as subject and object, and is concerned with relationships between public history, individual memory, and perception. He has had numerous exhibits in private and institutional galleries and museums in the U.S., Europe, and Asia, and his solo or two-person museum exhibits include the Art Institute of Chicago; Corcoran Gallery of Art, Washington, DC; Mattress Factory, Pittsburgh, PA; Orange County Museum of Art, Newport Beach, CA; and the Cranbrook Art Museum, Bloomfield Hills, MI. He is represented in St. Louis by the Bruno David Gallery and in Chicago by Zolla-Lieberman Gallery, which also represents Dan Ramirez. In 2013 Spector received the Distinguished Teaching of Art Award from the College Art Association. Among his other recognitions are a Louis Comfort Tiffany Foundation Fellowship in 1991, and National Endowment for the Arts Individual Artist Fellowships in 1982, 1985, and 1991. Visit Spector's faculty page on the Sam Fox School website. The Lorado Taft Midway Studios is home to the University of Chicago's Department of Visual Arts and Creative Writing program, housing classrooms, offices, and studios for students and faculty. The converted and relocated barn was formerly the art studio of sculptor, author and educator Lorado Taft (1860-1936). Taft designed a number of large-scale public projects, beginning with sculpture for the Horticultural Building (1893) at the World's Columbian Exposition, and including Blackhawk (Oregon, Illinois, 1911), The Columbus Fountain (Washington DC, 1912), The Fountain of Time (Chicago, 1922), and Alma Mater (Urbana, 1929). Taft was also an active member of the Chicago cultural community. In 1907 he opened the Midway Studios as a traditional atelier, training young artists who worked as his student assistants. Learn more about Lorado Taft here. Read more about the Midway Studios here. Ludwig Wittgenstein (1889-1951) is regarded by many as the greatest philosopher of the twentieth century. His two major works Wittgenstein’s two major works, Tractatus Logico-Philosophicus (1921) and Philosophical Investigations (published posthumously in 1953), have been highly influential in philosophy and in many other fields. Wittgenstein was born into a remarkable family in Vienna. His father, Karl Wittgenstein, was a leading figure in the Austrian iron and steel industry, and the Wittgenstein home was a center of Viennese cultural life—Gustav Klimt, Oskar Kokoschka, Sigmund Freud, Johannes Brahms and Gustav Mahler were regular visitors. Wittgenstein went to England in 1908 to study aeronautics, but by 1911 his developing interest in purely mathematical and logical problems led him to Cambridge to study with Bertrand Russell. Following this, he pondered philosophical problems in an isolated retreat in Norway. In 1913 he returned to Austria and joined the Austrian army at the outbreak of World War I. During a period of captivity in a prison camp he wrote the notes and drafts of his first important work, Tractatus Logico-Philosophicus. Following its publication, he gave away his fortune and worked as a gardener, teacher, and architect in and around Vienna. But he returned in 1929 to Cambridge and to philosophy. Over the course of time Wittgenstein revised his philisophical approach signficiantly, turning from formal logic to ordinary language. This development of his thought would eventually be expressed, posthumously, in Philosophical Investigations. 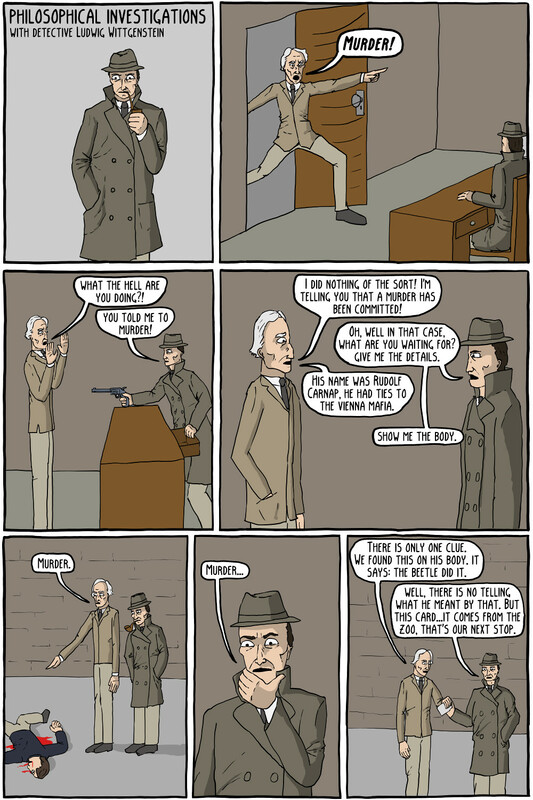 Wittgenstein died from cancer in 1951. Wittgenstein's thought cannot, of course, be adequately summarized in this brief entry. Find additional biographical information and discussion of Wittgenstein's writings on the Stanford Encyclopedia of Philosophy, the Internet Encyclopedia of Philosophy, and Wikipedia. Stephen Toulmin (1922-2009) was a British philosopher, author, and educator. A stuent of Wittgenstein, Toulmin devoted his works to developing practical arguments which can be used effectively in evaluating the ethics behind moral issues. His most influential work is the Toulmin Model of Argumentation, which employs six interrelated components used for analyzing arguments. Learn more about Toulmin on Wikipedia or in this New York Times obituary. Buzz Spector, Efface Nabokov, 2014. 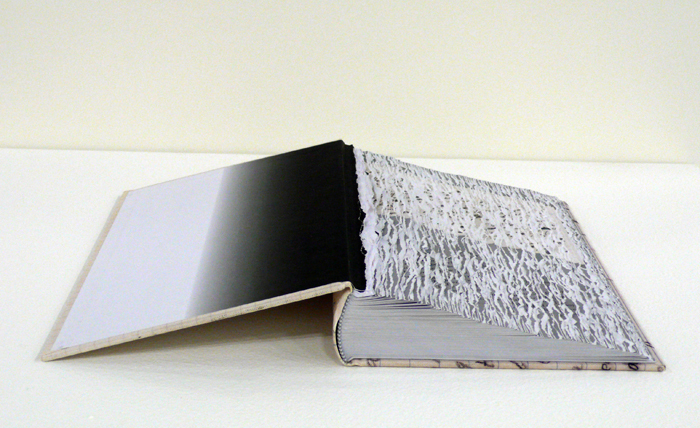 Altered Book (edition of 5). Courtesy of Bruno David Gallery, St. Louis. Spector has produced many art works related in some fashion to books , including reconstructions of libraries, found and altered volumes, and works on paper made out of elements from dust jackets. See more images of his work on the Bruno David Gallery website. Or watch this short 2009 documentary about an art installation by Spector at Cornell University. Wikipedia defines ontology a s "the philosophical study of the nature of being, becoming, existence, or reality, as well as the basic categories of being and their relations." Read the full Wikipedia article here. Read about ontological arguments for the existence of God in the Stanford Encyclopedia of Philosophy. Written by Luca Pacioli (c.1447-1517) and illustrated by Leonardo da Vinci (1452-1519), De divina proportione (On the Divine Proportion) was first printed in 1509. It explores mathematical proportions and their applications to geometry, visual art and architecture. Read more about the treatise on Wikipedia, or explore the book itself here. Olivier Messiaen (1908-92) was a French composer, organist--and ornithologist. Regarded as one of the major composers of the twentieth century, his music is rhythmically complex and harmonically adventuresome. Messiaen's musical language is derived from a number of varied sources, including Greek metrical rhythms, Hindu musical tradition, serialism, and birdsong. It has also been noted that his whole work and life were deeply influenced by Roman Catholicism. Extensive biographical and musicological discussion of Messiaen's life and work, as well as copious performances of his work, are available online. Check out the Wikipedia entry, or England's Philharmonia Orchestra's festival celebrating the centenary of Messiaen's birth. BBC Music also has a rich multimedia site devoted to Messiaen. Also check out this illustrated overview of the development of music notation systems. Or, for fun, take a look at these fantastical scores. Read a discussion of Messiaen's fascination with symmetries of rhythm and pitch . Or, explore this interactive demonstration of his modes of limited transposition. Read the program notes to a Naxos recording of Twenty Contemplations, or about the experiences of Jacqueline Chew in tackling the Twenty Contemplations. In 2015, pianist Cordelia Williams presents Between Heaven and the Clouds, "a year-long series of events setting Vingt Regards alongside words and images, including specially commissioned poetry and paintings, in order to explore these universal themes and Messiaen's rich variety of inspiration." Learn more about the project here. Daniel Ramirez, No. XVII: Contemplation of Silence (detail), 1980. Etching, aquatint and embossing. Courtesy of the artist. MOCRA presented Ramirez' Twenty Contemplations on the Infant Jesus: An Homage to Olivier Messiaen, in Fall 2004. Ramirez noted of the series, I have chosen the French composer Olivier Messiaen's piano compositions, Vingt regards sur l' Enfant-Jesus (Twenty Contemplations on the Infant Jesus), as the theme for theses prints so that I may pay homage to a man and to an art form that has been a great source of inspiration to me. In Vingt regards, Messiaen took up the same ideas of Dom Columba Marmion (Le Christ dans ses mysteres) and Maurice Toesca (Les Douze regards) wherein they spoke of the contemplations of the shepherds, of the angels, of the Virgin and of the Celestial Father. Vingt regards, according to Messiaen, is an adaptation of these four themes while at the same time an addition of sixteen new contemplations. In speaking about the contemplations, Messiaen has said that "... More than in all my preceding works, I have looked here for a mystical love, to be varied, powerful and tender, sometimes brutal, responding to multicolored commands." I too, in these twenty intaglio prints, have tried to formulate such a language—a language befitting the sublime nature of the subject. The first phase of this work began with a small series of pencil drawings and then was extended into the medium of printing. It was in the process of creating these images that an appreciation of the various intaglio techniques (etching, drypoint, electrically-vibrated drypoint, mezzotint, engraving and aquatint) became a dominant factor in the series. This was especially true when I realized that if I ignored certain relationships inherent within the medium, the language I sought would be severely limited. Some of the formal elements, such as line, space, and texture, that were peculiar to intaglio, revealed new possibilities when combined with blind embossing (a depressed element printed without ink). Accepting this interchangeability as a challenge and an opportunity to explore, I found that my visual interpretations often changed dramatically from the earlier drawings. It was during this change and while attempting to synthesize idea and emotion with the process that I experienced the fine line which connects form and expression, when personal meaning and the medium function as one. It was a moment in which I was able fully to appreciate and experience a sense of the self, the medium and the unexpected. I hope that with these twenty contemplations I have given to Olivier Messiaen the respect and admiration he so richly deserves, and that I have remained respectful of the medium of music which he loves. J.S. Bach labeled one of the canons in his Musical Offering, "Quaerendo invenietis" ("By seeking, you will discover"). Perhaps Messiaen would agree that Bach could have added "the unexpected" as well! Constantin Brancusi (1876-1957) was a Romanian-born sculptor, painter, and photographer who is considered a pioneer of modernism and one of the most influential sculptors of the 20th-century. He sculpted numerous variations on a limited number of themes, such as heads, birds, and fish. With their smooth surfaces and an emphasis on pure basic forms, they were simplified almost to the point of abstraction. Read more about Brancusi on The Art Story website, or find examples of his work on the Museum of Modern Art website. "Haptic perception" describes the perception based on the sense of touch, especially the active exploration of surfaces and objects by a moving subject. Haptic technology is a major area of innovation. Ramirez refers to two bowing techniques employed by players of stringed instruments. Arco refers to producing notes by drawing the bow across the strings; pizzicato refers to producing notes by plucking the strings with the finger. Watch this video for an explanation and demonstration. Read more about various bowing techniques on Wikipedia. Reagan Upshaw is a poet and critic who works as an art dealer in New York. His poems have appeared in Atlanta Review, Hanging Loose, the Poetry Project Newsletter, Able Muse, and others. His articles, interviews, and reviews have appeared in Bloomsbury Review, Boston Review, On the Bus, Poets & Writers, South Florida Poetry Review, Multicultural Review, Art in America, and New Art Examiner. Visit his gallery website here. Find samples of his poetry here. Read his poetry blog here. Maurice Merleau-Ponty (1908-1961) was a French phenomenological philosopher associated with the philosophical movement called existentialism. This movement proceeds from an analysis of the concrete experiences, perceptions, and difficulties, of human existence. Merleau-Ponty emphasized primacy of embodiment -- the body as the primary site of knowing the world, in contrast to the long philosophical tradition of placing consciousness as the source of knowledge. Read more about Merleau-Ponty on the Internet Encyclopedia of Philosophy. MOCRA owns two of the works from the Celestial City series. Daniel Ramirez, Caelestis Praesepe (Celestial Manger), 1989-90. Acrylic on canvas, aluminum, steel. MOCRA collection. Photo by Jeffrey Vaughn. Daniel Ramirez, Caelestis/Spatium/Res (Celestial/Space/Object), 1988. Acrylic on canvas, aluminum, steel. MOCRA collection. Installed at MOCRA in 2014. Photo by Jeffrey Vaughn. Watch a 1983 interview with Ramirez about this body of work. Messiaen's Couleurs de la Cité Céleste (Colors of the Celestial City) is a 1963 work scored for solo piano and 20 or so brass, woodwind and percussion instruments. He was inspired to write this work by a passage from the Book of Revelation that describes a wall of many colors in the heavenly city. Typical of Messiaen, the score includes elements of plainchant, Greek rhythms, chorales and birdsong. 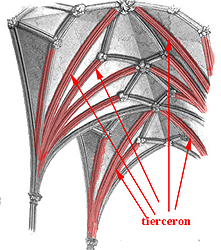 A tierceron star is a major rib in a complex rib vault, a feature of Gothic architecture. Learn more about Gothic architecture in this article from the Khan Academy.